The outside of the folder is covered with a fabric called sarasa. Sarasa is a Japanese term for the Indian Chintz which was first introduced to Japan in the late Muromachi period (late 16th century) through the Nanban trading. The Japanese were fascinated by the exotic and colorful fabrics from India, though they were only available to the small group of elites until later years. It was one of the favorite cloths of the tea masters. Some beautiful tobacco pouches and cases were made with this cloth in the late Edo to Meiji period. The Japanese started to produce their own sarasa when cotton became more available to them. Camellia oil was used to style the hair; this explains why the interior is so meticulously covered with the skin of bamboo shoots. 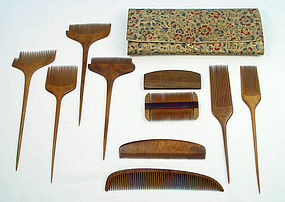 Today, there still are people who prefer wooden combs to plastic brushes, particularly the combs that are made of Tsuge wood (boxwood) because they are gentle on hair and scalps without causing static. We heard that there are many combs sold as Tsuge combs today which either do not meet the standards or are falsely advertized. The measurements of the pouch are: 9 7/16" x 3 3/4", the longest comb is 8 3/4" long.